Unlike other PCB design tools, in Kicad, schematic components are not automatically linked to a footprint. This of a footprint as the outline of a component that is mounted on a circuit board. It contains the outline of the pins, the device, and often text markings with the name of the device or its values. In Kicad, we must associate schematic components to footprints using a tool called Cvpcb. 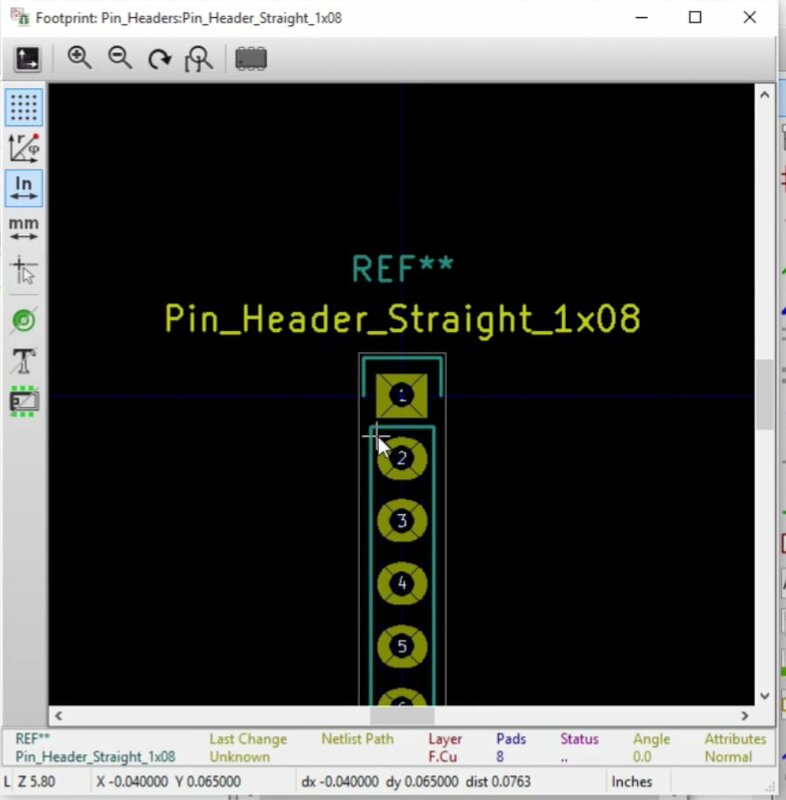 The straight pin connector that we’ve got on the schematic already has an associated footprint in the library and we’ll simply select it for that part. There is no footprint to associate with the nRF24 component, so we will need to create one. 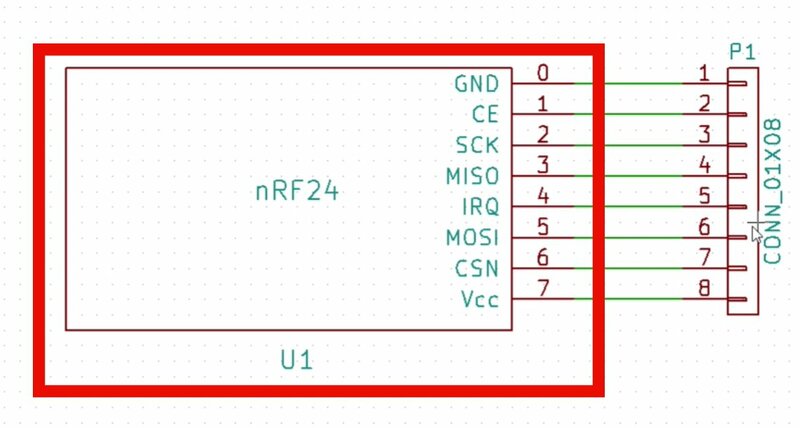 However, the nRF24 part is a custom component and it doesn’t have an existing footprint in the library. We will have to create a new one for that. To start Cvpcb, click on the Cvpcb button. 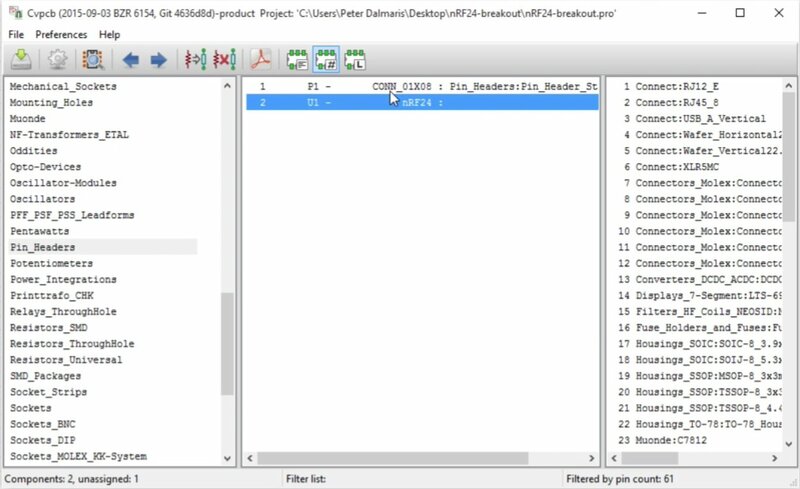 It takes a few seconds sometimes for all the panes to be populated with data and records because, in the background, Cvpcb is accessing the Kicad repository on GitHub.com for schematic components and footprints. 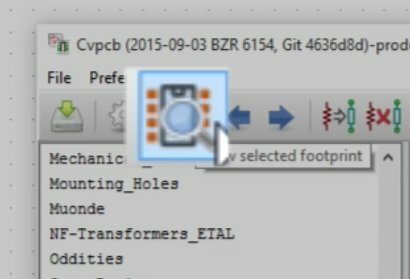 The Cvpcb tool allows you to find footprints via browsing or through filters. On the left pane are the footprint libraries. On the right side, are the contents of each library that is selected at a given time. And in the middle pane are the components from the current schematic. You can see here that in the middle pane we have two components: the connector component (P1), and the custom part, nRF24. 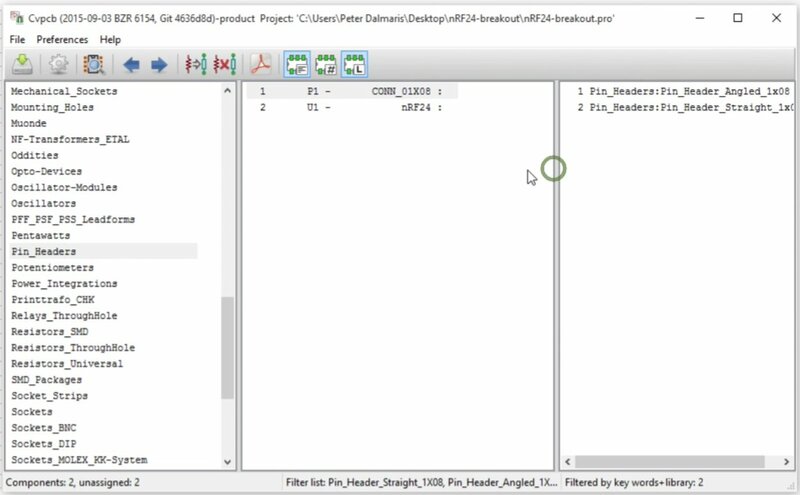 For the connector component, look through the contents of the “connect” library. Once you click on the Connect library in the left pane, you will see in the right pane all of the components from all of the libraries. This is not very useful. I wish to narrow that down to just the parts that are a member of the connect library. To do this we will use the three filter buttons, found in the right side of the top menu bar. Click on the filter marked “L”. In the right pane we now have only the footprints that are members of the Connect library. We can also narrow down the hit list further. Select the straight connector component in the middle pane, and then click on the “#” filter. This will return only those components that match my selected component by pin count. All of the members of the connect library that are displayed are those with eight pins because we have enabled the pint count (“#”) filter. Finally, we can also use filter with the text document in its button icon (third from the right), and narrow down the hit list by keyword. Once you click on that, notice that the right pane is now empty. This means that there is no component in the connect library that has the name con_01x08. Therefore, we were incorrect in looking in the Connect library for this particular footprint. The straight connector footprint is in the Pin_Headers library. Notice the enabled filters, at the right side of the toolbar. The one that I would like to go with is the header straight 1×08. So, double- click on this record in the right pane to select it. You can also preview a footprint, and double check that this is what you need. To preview a footprint, click on the preview button. 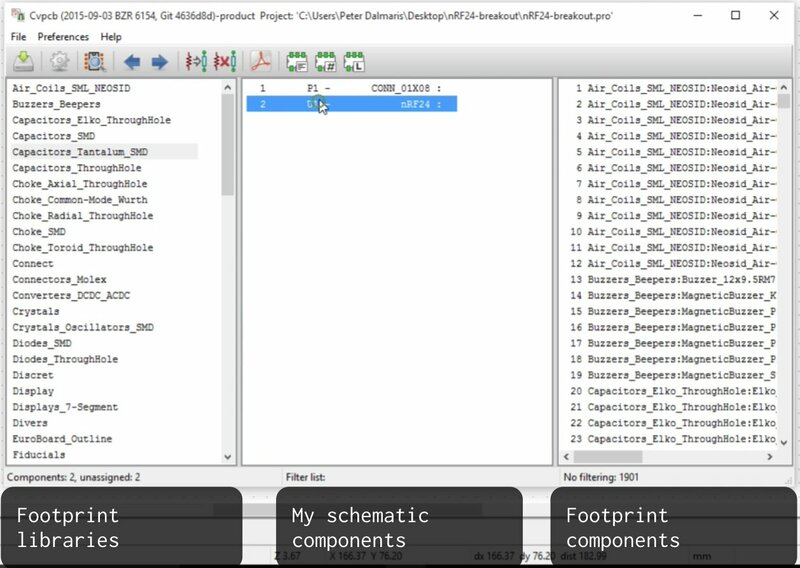 Click on the Preview button to see a preview of the selected footprint. As for the nRF24, there is no component available in any of the libraries. We will have to create one. 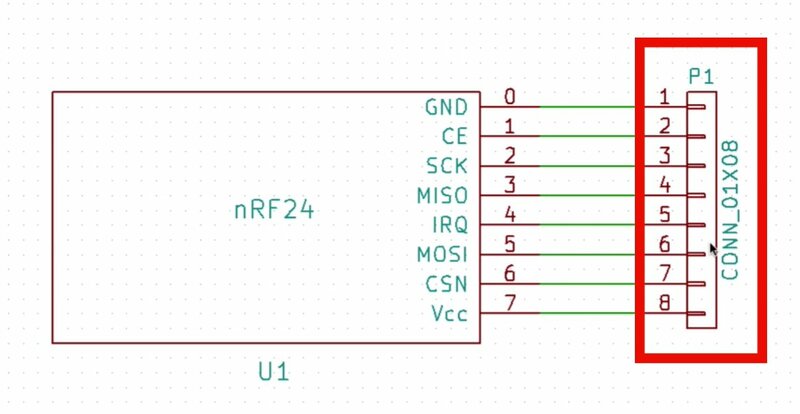 Save the current associations and let’s work on a custom footprint for the nRF24 component in the next chapter.